Trained in surviving even the coldest winters, this creature has strengths unimagineable. This tower deals 30% more damage to stunned creeps. PENDING UPDATE: This tower is a not yet accepted update to Collosal Abominable Snowman v6. 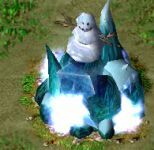 This is the discussion thread for the tower update Collosal Abominable Snowman (1874).